4.1 DJHI "Did Ja Hack It? The cartridge connector of the LeapFrog Pollux Platform family of devices makes available two very useful set of pins. There is a TTL level UART connection, and connections for an SD card. With a MAX232 level converter the UART can be connected to a terminal, to give you console access to your device. While hooking up an SD card can allow for extra storage or with some additional software, contain a bootable operating system. 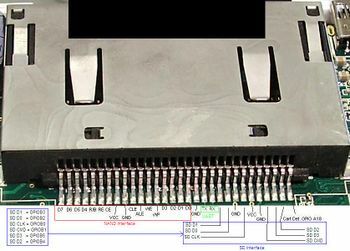 The cartridge connector has fairly easy access, once the case is removed, to solder wires on to it. A warning, it is tight, so you should be moderately experienced with soldering at least. You can use these pinouts to break out what connections you need, using this method. Cheap and easy if you have the parts already. Much easier than soldering to the connector in the device. USB adapter pictured for UART access. DJHI "Did Ja Hack It? Completely built and ready to use, requires only USB to Serial adapter. These are boards designed by people who provided the necessary files for you to order your own PCB, or etch one at home. If you have the know how, or need something special, this is a good place to start. Allows access to all connector pins. Cartridge locks in like the OEM version. You will also need a spacer on the top and bottom and those dimensions are also included. Board untested, use at your own risk. 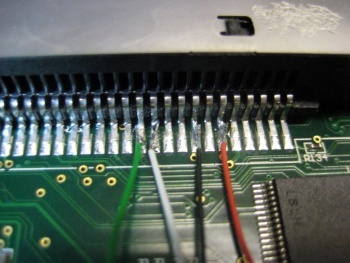 It is possible to directly solder wires to the back of the cartridge connector. If you don't have a cartridge that breaks out the necessary connections, and you're good with a soldering iron, you can carefully solder on the necessary wires to the internal connections. Then bring the wires out to your serial adapter of choice. TX, RX, GND, and VCC soldered directly to the pins. Picture of the pinout of the LeapFrog Pollux Platform cartridge slot (Underside). This page was last edited on 25 November 2013, at 20:14.